Kindle is the most popular e-book reader inAmerica, which allows users to download, shop, browse and read magazines, newspapers, blogs and other wireless networking and digital media. 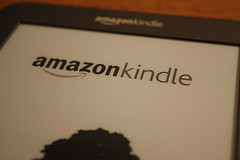 Kindle is dominating the market and also increasing the sells for millions inAmerica. Amazon has launched two new designs for Kindle device- Kindle keyboard 3G and Kindle keyboard. Its connectivity is similar to Apple’s iPad where the similarity ends. The screen size of the Kindle is same as 6-inch E-ink display as it was before. But now it is 190 x 123 x 8.5mm in size and 241g in weight. So, its size and weight both have been reduced. The new desirable dark graphite color makes Kindle more grown-up, mature and less dirty. The new leather case powered by Kindle has built-in light so that you can read in relax manner and dark night. This Kindle model is not touch screen and therefore allows you to navigate through series of button at the below side and underneath keyboard. Even if the screen is 6-inch electronic paper display it has optimizing features like front technology and waveform property. It also offers a 600 x 800 pixel resolution at 167ppi and 16-level grey scale coloring. For getting in to new design, the old keyboard is squished and rearranged such that keys have no worse effect due to it. The buttons look more responsive as the D-pad has been moved from the edge to main keyboard. No one does more typing but the keyboard is present to make the search and menu selection easier. The new screen is fifty percent improved in contrast than the old one. Fonts used in the books on the reader are improved in the way to create new custom, hand-built fonts and the font hinting makes the letters and words crispier and clearer with natural look. The new font hinting feature added for optimizing special characters of electronic ink. The time taken to refresh or turn the page is speeded up to make reading easier. The rate of turning the page is now twenty percent faster. The black screen is seen just for less than a second before the page is refreshed. It’s not easily noticeable but still the speed is better that it was before. Kindle is well fixed for reading books and documents but the software is the same as before. It means that you get everything you expect like social interaction options, book marketing and the ability to access your books stored centrally on other Amazon Kindle apps. You get spacious library to store about 3500 books as the memory has been increased form 2GB to 4GB. You can choose to fill this memory with music, PDF files , podcasts and other file formats which Kindle supports like Kindle(AZW), Audible enhanced (AA, AAX), MP3, TXT, PRC natively; (HTML, DOC, JPEG, GIF, PNG, BMP) and unprotected MOBI. Connectivity has two major options – Only Wi-Fi or 3G and Wi-Fi. The 3G model is launched by AT and T in US which basically offers the download option wherever you go with no additional data charges. It is ready to work when you want without any contract or monthly subscription bill. Wi-Fi is designed with cheap prices for those who don’t think the need to download a book on the beach. The battery is long lasting but needs to be charged when shows a low sign. Other notable feature is the USB 2.0 to connect the adapter or computer and rear-mounted stereo speakers with 3.5mm stereo audio jack. Guest Author Bio : Myself Stecey Hayden. I am a geeky writer, I always like to collect an information about latest laptop trends, geeky gadgets and technological news. Previous Entry: How to create an intuitive drill-down interface? Previous Entry How to create an intuitive drill-down interface?